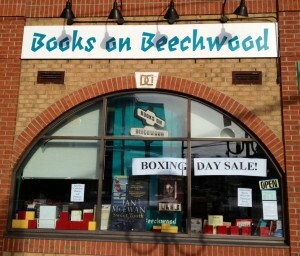 Boxing Day Sale at Books on Beechwood!! 25Ùª off every single hardcover book in the store!!! Ok, almost all of them.. the ones already on sale are not going to be discounted twice! It sounded so simple at first, then we realized that means telling the computer that all of our hardcover fiction, hardcover mystery, history, biography, art & music, science & Nature, economy, politics, Canadian history, travel, cookbooks, kids hardcover, sports, humor, what did I miss? are all on sale today only!! All the calendars, agendas, planners and diaries are on sale at 25Ùª off! And last, but not least, all of our Christmas books are 40Ùª off today! We are open today until 6pm.